Atheneum Books for Young Readers, 9780689825965, 160pp. Mark didn't ask to move to New Hampshire. Or to go to a hick school like Hardy Elementary. And he certainly didn't request Mr. Maxwell as his teacher. Mr. Maxwell doesn't like rich kids, or slackers, or know-it-alls. And he's decided that Mark is all of those things. Now the whole school is headed out for a week of camping -- Hardy's famous Week in the Woods. At first it sounds dumb, but then Mark begins to open up to life in the country, and he decides it might be okay to learn something new. It might even be fun. But things go all wrong for Mark. The Week in the Woods is not what anyone planned. Especially not Mr. Maxwell. 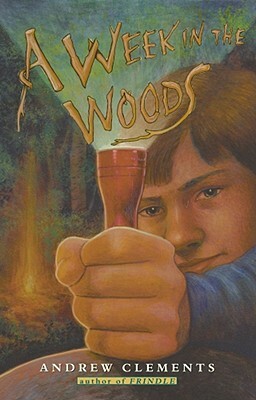 With his uncanny knack to reach right to the heart of kids, Andrew Clements asks -- and answers -- questions about first impressions, fairness, loyalty, and courage -- and exactly what it takes to spend a Week in the Woods.